not totally protect your kitty from fleas." How Do They Kill Fleas? Conventional flea collars work by emitting toxic nerve gasses that are absorbed into your cat's skin. These gasses are also inhaled by your cat. Some people feel that the use of toxic nerve gasses is a good enough reason not to use this option in their efforts to get rid of fleas. Also, this method is rarely effective on its own. You will most certainly have to take other measures to completely get rid of fleas and protect your feline friend from future flea infestations. Since flea collars alone are not very effective, the potential risks to your cat's health may outweigh any advantages to using those containing chemical pesticides. While they can be used as a part of your efforts to get rid of fleas, the potential risks to your cat's health and the fact that they are not very effective, make this flea control measure a less desirable option. Recommendations to offset the toxicity of the chemicals used in some flea control products include supplementing your cat's diet with vitamin C everyday or using herbal remedies to detoxify your cat. Both methods should help detoxify your cat's system. Be particularly careful of products containing DDVP (dichlorvos). DDVP is a suspected carcinogen and is an ingredient found in several different flea products. It's absorbed into your cat's system. DDVP builds up in your cat's body tissues. Check the label for vapona, 2,2 dichlorovinyl dimethyl phospate. This is another way that DDVP is listed on labels. For your cat's health, try to avoid these insecticides. Or better yet, consider using an herbal collar. To choose the right size for your cat, you should use the same guidelines as you would for regular cat collars. Make sure that any collar you put on your cat has an elasticized section or a break-away feature for your cat's protection. Be sure to regularly remove your cat's collar to check for any skin irritation. If you choose to use a collar (either conventional or herbal) to try to give your cat some relief from fleas, you will probably need to take additional steps to get rid of all the fleas in your cat's environment. 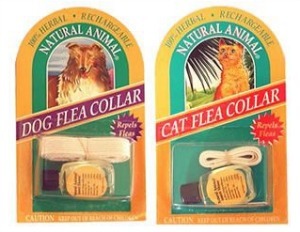 If you have successfully eliminated all the fleas in your home and in your yard (if your kitty goes outside), then there is no need for your cat to wear a collar containing flea insecticides. Didn't find what you're looking for? Use this Search Box to find more information. Or visit the articles below. Conventional Flea Control Methods - Essential information to help get rid of fleas. Natural Flea Control - How to get rid of fleas safely and effectively with alternative methods. If you suspect your cat is ill, please contact your veterinarian immediately. The material presented in this site is for informational and entertainment purposes only. It is not intended to replace your veterinarian's advice.